I admit it is not an easy job. To be me. But God made me the way I am and I have no other choice than be myself. Even if sometimes I would like to be comfortable and go along with everybody else. People say that I am “intense” and sometimes it is difficult to deal with me because of my straightforwardness, intensity, personality, and my stubbornness. They tell me I am very particular and often significant to the point of absurdity. I wish I was more like everybody else who has 9-5 job and is set in their life. But I am not. I can only be me, according to you – the crazy one, who stirs things up, who reinvents things on the spot. With no remorse whatsoever. None. At all. 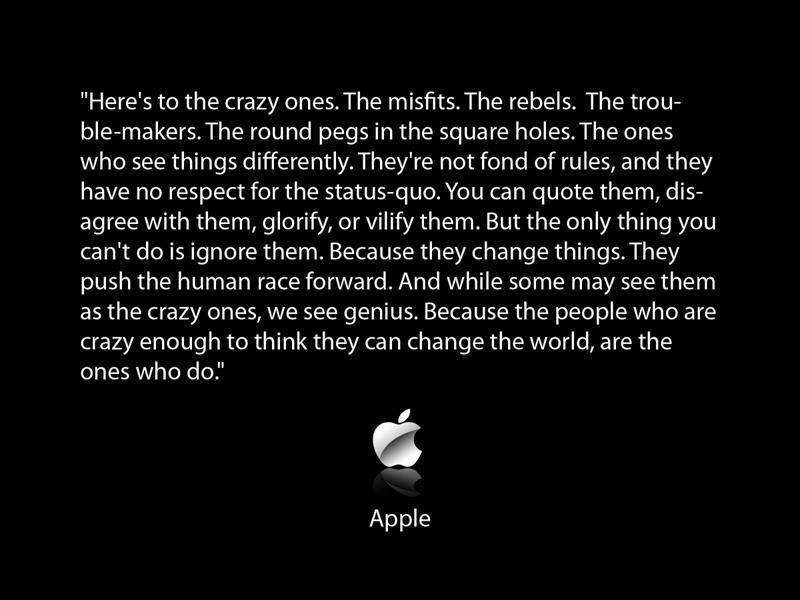 So did Steve Jobs. So do you. When you choose the path less traveled, and in the midst of it, you ask yourself: “What the hell am I doing? !” But somehow and someway you just don’t see any other path. It’s just not there. And you know how it is when you know it must be a mistake. You pray and beg that you would see… Something! Route 52, detour, highway, paved road, under construction, meadow you could walk through, sewer tunnel, something. And there is not, literally, any other way. People think that you are nuts and you are trying to be special, but no, you are not trying dramatically to be special, you are simply yourself for their information. Which is probably even more crazy. It’s hard to explain, but there is a certain kind of being oblivious in the whole situation that people outside of me don’t understand that exists. Yet, it is there. Right there, you’ve seen it: innocence, naivety even. It has served me right, though, not to be judgmental in situations that I could easily be, if it was not for that. And here I am doing things that nobody does the way I do: sound therapy, intuitive readings, coaching, yoga, teaching how to use language and singing. Yes. That’s right. I sing. And write songs. All of these things are the vessel for my music and songs really. They are various forms of it. ← Announcements and changes in the events.